Automation is essential to maximizing throughput, especially when it comes to being able to confidently release quality software. I believe that anything you find yourself repeating is a great candidate to automate. In most cases, these repetitive tasks can be represented as simple functions! 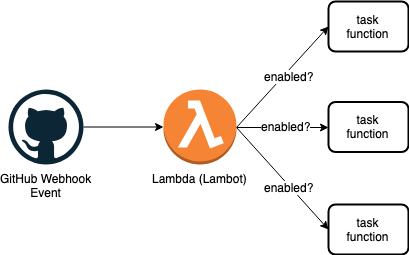 So that got me thinking… maybe I can leverage AWS Lambda for this– things like pull-request review hooks and automatic package versioning + publishing. In many ways, this is like creating a more powerful and customizable version of CodeBuild, CircleCI, or Concourse from scratch (all of which I’ve drawn inspiration from after using)! Moreover, this serverless solution costs nothing when it’s not in use and it’s much more flexible! Ultimately, this led to the creation of our own GitHub webhook “bot” we call Techie. In this post, I want to share how easy it is to create your own extensible bot! After we’re done, you’ll have a Techie look-alike that is configurable with it’s own YAML file and able to leave comments on untagged pull requests, perform CI code reviews, and automatically version and publish your npm packages! Feel free to view the completed source on GitHub. For brevity, I’m only going to touch on the main aspects of our bot; you can reference everything else in the repo! Let’s get to the code! # Prefer labels on pull requests; notify if missing. Get the configuration, preferably from master or another predefined branch so we can consider it our config single source of truth. I’ve also experimented with using the config in the branch where the event is emitted; sometimes that works better! Parse the configuration and asynchronously run the tasks. Send a response (success or failure). We’re expecting a YAML configuration (lambot.yml) to be present in the repository. If a configuration is missing we’ll respond with a failure, otherwise, let’s try to run the specified tasks asynchronously (they each return a promise). Wait for all tasks to run, then send a final response. Easy enough! Now you might be wondering what a task function looks like… so let’s keep going. You might have noticed our example config includes three hooks… semver, labels, and codereview. Let’s breifly go through how they will work, starting with the simplest– labels. Pull-request labels help us stay organized. The purpose of our label task will be to post a friendly comment on newly opened, unlabeled pull-requests, encouraging the user to add a label. Versioning and publishing npm packages can become quite monotonous. That’s when I got the idea… wouldn’t it be great if we could handle that automatically based off the head commit (it includes the title + commit history if you’re squashing commits), and look for [breaking|feature] (or [ci skip]). For example, a pull-request with [breaking] Major API changes would cause our package to increment and publish a major version. Now, one challenge when working with Lambda + API Gateway is that your task must complete within 30 seconds. Even if we could install, lint, and test our code in 30 seconds I don’t like the possibility of random timeouts… so this is where we’ll get fancy ✨.​ For tasks that require heavy lifting, we can offload them to AWS ECS– which can run as long as they need, in any environment we want, only when we need them, therefore being cost-effective. Fantastic! In our semver task, we’ll call spawnDockerTask (a utility for running a task in ECS) and pass a list of commands to execute in our container, as well as any additional information our container will need. If the task starts successfully, spawnDockerTask will return a resolved promise. Finally, we need to setup a repository to use our new bot. This is the easiest part! Here’s a fun exercise: try implementing the codereview task yourself. Hint: You’ll need to use the config property passed to our task function. With codereview, the goal is to allow a custom sequence of commands to run on each pushed commit. It’s similar to our semver task, but it also utilizes the status API to report if the commands pass or fail. Once you do that, you’ll practically have built your own CI tool! How cool is that?! Automation is fun and it maximizes productivity; a win-win if you ask me! We also learned about Lambdas, ECS, and the GitHub API. Now you are fully equipped to create your own custom tasks! Feel free to reference the GitHub API for all the different events you can use. What’s even better is that your bot can run in any repository (as long as it has access and a valid config file)! What else is there to automate? That’s now up to you! Originally published at beuteiful.com on April 5, 2019. By day, software engineer. By different time of day, barista. By night, do whatever I want- no job. One of the big HBC Digital initiatives for 2017 is “buy online, pickup in store” - somewhat awkwardly nicknamed “BOPIS” internally. This is the option for the customer to, instead of shipping an order to an address, pick it up in a store that has the items in inventory.